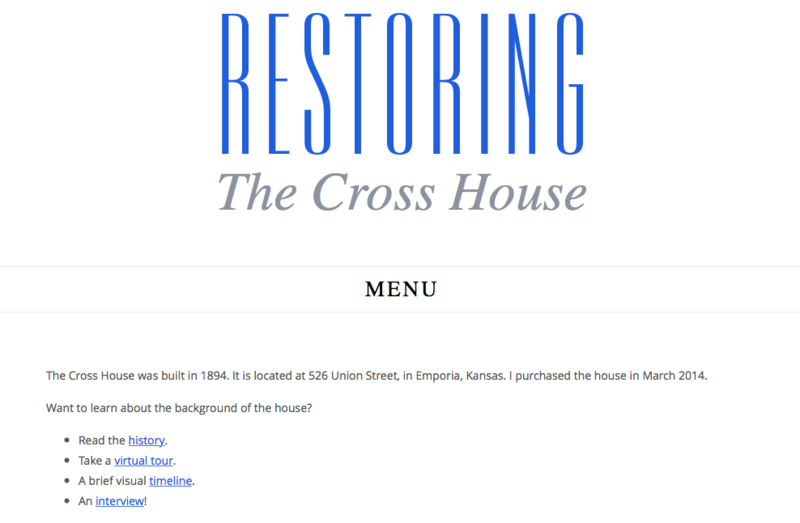 When I purchased the Cross House in March of 2014, I had a vague idea of doing a blog. Then in short order I was startled by the level of interest in the house, and realized that creating a blog needed to be pushed to the top of the To Do list. So, RestoringRoss went online in July, 2014. I love old house blogs, and over the years have devoured countless blog posts. So, doing my own blog was kinda intimidating. Above all, I wanted a blog which was user-friendly. This seems obvious, right? But many blogs are really hard to use. Why did you buy this old house? Can I get a BEFORE tour of the house? This is at the top of my Cross House main page. Readers can click on the links in the lower left and learn a lot about the house right up front. Clicking on MENU will offer an ABOUT ME page. The first blog post explains why I purchased the house. It is the nature of blog coding to default to Most Recent posts first. So, if I discover a blog about a restoration now in its sixth year, I will easily find the most recent work, but will have to work hard at finding the beginning work. And I cannot enjoy the recent work, not really, until I know ALL the work. I am just wired this way (all my friends know that if I am late for the first five minutes of a movie, I will not watch it). In creating my blog, I worked with Tracy at IM Design to make sure that readers could effortlessly choose how they view the site. On the main page listing all my posts, just above the first post shown, is a notice. My posts default to chronological order (the reverse of almost all blogs). This makes it easy for a new reader to start at the beginning. But, a person already familiar with the blog can click to Most Recent first, and the whole thing will reverse in an instant. This format should, until you tell it otherwise, then remain as such. This option — Chronological or Most Recent — is something which Tracy had to work hard at creating because such coding is not the norm for a blog. Thank you, Tracy! I was adamant that leaving a comment should be effortless. Many blogs make you jump through hoops before being able to comment. On one blog it took seven tries before my comment posted. Seven. It should not be surprising that this blog rarely has comments (to the point where the blogger asked: is anybody out there?). I was hugely influenced on this issue by Old House Dreams. Kelly, the creator of OHD, offers effortless commenting, and an effortless way to receive new posts, and later comments on any post you might comment on. Kelly graciously forwarded me the Plug-In she used. Thank you, Kelly! My images are BIG. This freaks out the server hosting the site, and I recently had to change the host to one with a much larger server. But I think readers should be able to SEE the images. Another focus was to make the blog easy on the eyes. So there is a lot of white space. When I started the blog I thought it would receive, I dunno, a dozen views a day. I mean, how many people would be interested in an old house in Emporia? However, in my first six months I received 13,885 views. Huh? WHERE did all these people come from? In 2015 I received 164,888 views. In 2016, just over three months to date, I have received 86,517 views. Now, Old House Dreams receives about a million views every month! So, my numbers are nothing by comparison, but I am nonetheless stunned by the results. I am currently averaging about 1300 daily views. I would never never never have expected this when starting the blog. The last month of stats. Kelly from Old House Dreams offered excellent advice before I started this blog. She told me that she did all her own maintenance, and that this took up a ton of her time. She said that if my time was limited, I should hire a company to maintain my blog. As I have zilch extra time, I had enough sense to follow Kelly’s advice, and thus retained IM Design. Thank you again, Kelly! By doing this, I was also not dependent on standard blog platforms and could have a fully custom site. This then allowed a lot of what I desired in a blog. RestoringRoss has become WAY bigger than I ever expected. Not only the number of viewers, but how much time it takes. It is like I had a baby! And taking care of this new creature requires a lot of effort. This effort comes at the expense of my business. Like now. Instead of spending an hour or two restoring a vintage light and getting it listed online, I wrote this post. And posted it at almost 2AM. Bed here I come! So, restoring the Cross House and maintaining RestoringRoss and running my business is a constant juggling of time. Before the Cross House I spent seven days a week on the business; it was my life. It defined my life. And I had grown weary of this. Bone weary. My life SO much better now, even though it is more complicated. And the following is hard to explain but I have this feeling that the Cross House and this blog are going to prove important to my future in ways I could not imagine now. I trust this feeling. I also believe that following a passion is good. And I feel deeply passionate about the Cross House and this blog, and these passions are nourishing. Yes, I am proud to have built my business from nothing, and am grateful to be earning a good living doing something I enjoy. But it nonetheless feels more like a drain than nourishing. I suspect that a great many of us have this exact same struggle between earning a living and following our passions. Ah, would that life be easy. Restoring Ross! I only recently discovered your blog and I have already devoured every word and (large) picture. My husband and were cracking up about your carriage house kitchen (we had a similar experience when a weekend painting project resulted in us ripping out the ceiling and floors of our kitchen out of “curiosity”.) I am 23 and live in LA and find old houses here so out of reach. Until we find our project, we live vicariously through stories like yours! Thank you! I love that you put so much thought into those who would be viewing your site. You hit absolutely everything I love about visiting it. The fact that I could view it in chronological order when I first found you, that the pictures are big and clear, the design is clean and easy to navigate… It’s SO refreshing! Mad props to you and Tracy! Read you from cover to cover as I have always been a major Victorian house fan. Been away for about a week as smartphone crashed but got it fixed and am catching up. What Marie said! When I first discovered your blog, I spent all my spare time reading for days starting at the beginning, going up to the present. I have also been led to other “restoring” blogs through your blog. This is now my favorite form of online reading. Very few can come close to your delightful style, big pictures, and open honesty. I might put Doug and Amy, and Carla up there with you. Thank you for opening up a new world for me. After a hard day of “meting… unequal laws unto a savage race” I stagger home to my own, admittedly less vast (half-vast?) project and head for the computer: MUST. HAVE. ROSS. (1) You know your way around the language, and photograph and write with illustrative precision and wry humor even in the face of tough times. (2) You know your stuff, and research in new areas with a learning curve that seems to go straight up. Like that grand man John Foreman of Big Old Houses (who we keep in our prayers), reading Ross is both entertainment and an education. How do you find time? Do you sleep at all? John, you make me smile! And I am dying to know about YOUR half-vast house! Oh, and I love sleeping. Eight hours at night. If not, a nap the next day will be required! Yes! You have! I remember now! I loved following John Foreman’s travels and was stunned when he responded to a comment I left. Since he has passed he is missed but I am still revisiting his posts and catch myself wanting to comment. He was wonderful to follow and never missed a chance to see an original bathroom or boiler… the grand spaces and the service areas were both important. Please keep it up. I truly enjoy reading this blog. And it makes my 4000 sq ft house seem downright reasonable! Derek, where is your 4,000 sq.ft. house? Do you blog about it, or have a Facebook page? We live on the SouthSide of Chicago (not all uniformly bad, as some suspect). We live in the Jackson Park Highlands Historic District at 7000 S Bennett Ave – I think the Google view is still old. One of my favorite things about the house is the “crazy slate” roof. It was designed to look old from day one. The house is very comfortable, and we really enjoy it. It was in pretty bad shape when we bought it, with collapsed ceilings and a lawn mower in the living room (not that they mowed, much to the consternation of the neighbors – and of course they did not put the mower in the garage because they had not fixed the doors to actually open). We did an FHA 203k to buy and fix it. That was a nightmare, but I am glad we did it. It took 13 months to move in, not the promised 3. Thanks to reading you and Kelly, I have started blogging. Check out this if you want. We are trying to sensitively fix up a historic 2 unit in the next neighborhood over. I really enjoy your blog, and have been looking at the lights! Wonderful. We uncovered a bunch of electric sconce boxes and had to find a bunch of fixtures. Wish I had known about you! Hi Ross, your blog is perfect. White page, pages and pictures loading very fast, and that chronological order is perfect. Whenever I look at blogs it is always difficult to find the oldest posts and a pain to then switch to the next in chronological order. I can’t even remember how I came accross your blog. Maybe through Kelly’s OHD, but not sure at all. When I’m bored at work I spend a lot of time on OHD and looking at American sales listings and restoration. I’m French and your types of houses are so much different in everything (style, construction — wooden/balloon frame, hardware, size… size!!). I have been reading your blog posts for a few days now (yup, been bored at work for a couple of weeks eek…) and I’m getting a bit sad because I’m now almost at the end and back to today’s updates. No more binge-reading. I just love love love how you do most things on your own and keep discovering new features and keep investigating and hope you can restore most of them. A real scavenger’s hunt! I talked about your “adventure” to my boyfriend, who’s currently working in our stone barn (lime plastering on and around the exposed stones). I’m sure he’ll be fond of your restoration if he finds time to read your blog, he loves to tinker and learn new techniques. I must arouse his curiosity by telling and showing him more about your Cross House. Anyway, long long post. I’ll stop my blah-blah now and will stay tuned for the following episodes of your adventure. Keep it up!! Ross, I love that you chose to go chronological rather than most recent post first. Your blog is so much easier to navigate, read and enjoy than most – more like reading a book. And there’s nothing I love more than reading a good restoration memoir! As you may have gathered from my frequent comments, I enjoy your blog immensely. I know it takes a lot of time (as demonstrated by my blog with a solitary post 2 years ago), but I’m glad you make the effort. It’s a great way to share the art and beauty of your wonderful house, as well as the valuable information to other restorers. On top of all that, it helps bring together old house nuts and build a community of us who would likely never meet in person. Finally, I like the format and organization too. It’s much easier to navigate than many others. I also appreciate the ease of commenting. It’s ridiculous that some blogs require a special account to comment. Thanks so much for all your comments, Seth! It’s been fun “meeting” you! I LOVE that you designed it easily to start at the beginning and continue reading chronologically. I have found many blogs that pique my interest but had to give them up due to poor layout and lack of binge-worthiness. At the top of the Cross House main page, you can click on RECENT POSTS first and everything will reverse in an instant. This is helpful if you have read all the old posts!